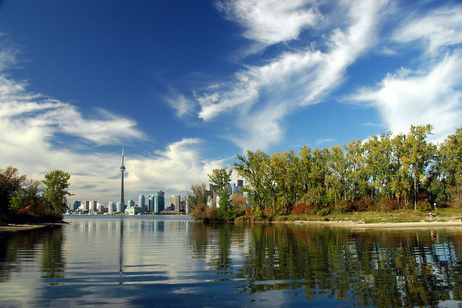 The weather has been harsh, yet it had little impact on the piping-hot real estate market in Toronto. House sales rose only 2.1 per cent, while prices jumped 8.6 per cent year-over-year. There's a serious shortage of new houses, which are 12.2 per cent down compared to a year ago, and people are desperate to buy before homes become too expensive. Low-rate mortgages encourage buyers to enter the market before it's too late and prices spin out of their reach. It's incredible to see how many people are entering bidding wars. Some buyers are reportedly registering bids on houses they think they like but haven't had time to see. By registering their interest, they'll be in the loop as the deadline for bids approaches. They know they can withdraw their bid once they see the house if they don't like it, but if they haven't entered the bidding competition, the house could be gone by the time they decide. The shortage of new properties is much higher in the city than in the rest of GTA, so prices kept rising accordingly. Detached houses saw an incredible 15.7 per cent price rise. A lower supply of houses simply motivated people to bid higher on their dream properties, and that resulted in a $955,314 price tag on average. House sales climbed 8 per cent, with 668 houses sold over the past month. Semi-detached houses behaved similarly in February 2014. There were 202 semis sold last month, which is 11.8 per cent less than a year ago. The average selling price rose 8 per cent, to $668,298. The average price for a townhouse in the city was 20 per cent higher than a year ago, at $545,043. The townhouse battle was even tougher than the fight for detached houses, and only 207 houses changed owners, resulting in an 8.8 per cent sales drop. 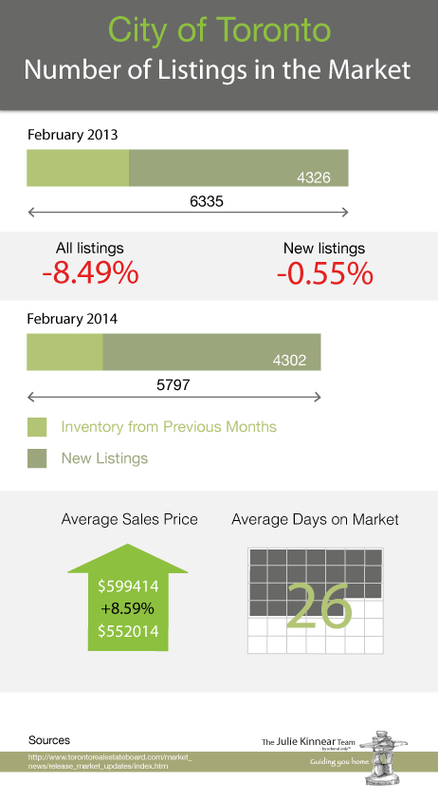 Condominium listings were the least affected, and they were selling great in February. There were 1,031 units sold, for an average price of $372,628. Both the number of sales and the average price increased — by 9.6 per cent and 6 per cent, respectively. 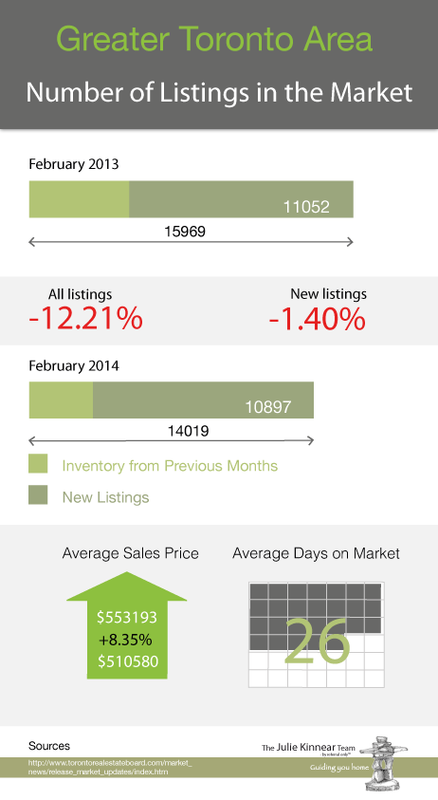 "Despite the continuation of inclement weather in February, we did see a moderate uptick in sales activity last month. The sales increase was largely driven by resale condominium apartments,"
said Dianne Usher, Toronto Real Estate Board (TREB) president, in a release. Buyers interested in a property in the 905 area weren't under as much pressure as those buying properties in the city itself. The most sales and lowest price rise was recorded in the condo market. There were 463 units sold over the last month, which is almost 20 per cent more than a year ago. The average price rose by a meagre 3 per cent, to $290,650. Semi-detached houses sold for 5.6 per cent more last month than they did in February 2013. Last month, buyers invested (on average) $425,052 in a semi. Sales increased 4 per cent, to 388. Townhouses were the only property that reported a negative sales number in the rest of the GTA. There were 634 houses sold, which is 4.1 per cent less than a year ago. We can see that the demand for this property type was high, as prices increased 7.3 per cent, to $400,165. Sales of detached properties were 3.2 per cent higher year-over-year, and 2,028 properties changed owners. Homebuyers paid $640,405 on average, which is 10.4 per cent more compered to February 2013. 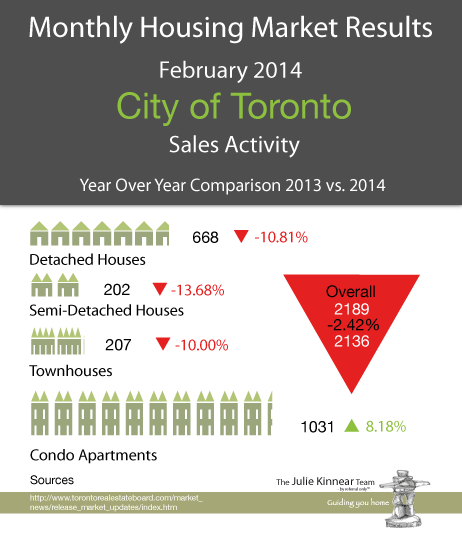 Most of the uptick in overall GTA home sales in February came from condominiums. Condo supply is keeping demand and prices more stable. "I think the big story is how well Canadian home sales — and even more so prices — have held up during the extremely harsh winter we have had across most of the country,"
said BMO chief economist Douglas Porter for the Toronto Star. In total, 2,696 detached houses changed owners. The number of sales increased 0.1 per cent year-over-year. However, buyers who waited and entered the market last month paid 1.2 per cent more than they would have a year ago. The average price is now $718,432. Semi-detached home sales dropped 2 per cent compared to last year, with 590 houses sold. The average price rose by a moderate 4.9 per cent, to $508,333. New townhouse owners were willing to pay 10.9 per cent more for a house than they were last year. The average price is now $435,825. In total, 841 townhouses sold last month — 5.3 per cent fewer, year-over-year. Condo apartments are moving steadily through the hot waters of the Toronto real estate market, with 1,494 units sold for $347,222 on average. Condominium sales increased 12.5 per cent, and prices climbed 4.8 per cent. "While the strong price growth experienced over the last year should prompt an improvement in the supply of listings, sellers' market conditions will continue to prevail this year. Home prices, on average, will trend upwards at a pace well-above the rate of inflation. The impact of strong price growth on affordability will be mitigated by low borrowing costs,"